My arrangement of an early date, 'Sonata' from Cantata No.182 "Himmelskönig, sei willkommen" BWV 182 is available on Sheet Music Plus. look inside Sonata from Cantata No.182, for piano solo Composed by Johann Sebastian Bach (1685-1750). Arranged by Hiroyuki Tanaka. For Piano Solo. Baroque Period. Advanced Intermediate. Piano Reduction,Solo Part. 3 pages. Published by Hiroyuki Tanaka (S0.130151). 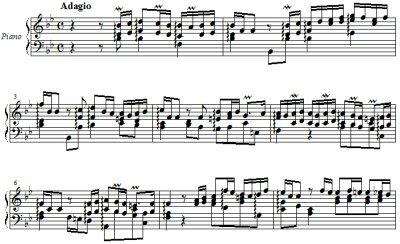 Now my arrangement of an early date, Largo from Trio sonata in c minor ~ Musical Offering BWV 1079 is available on Sheet Music Plus. 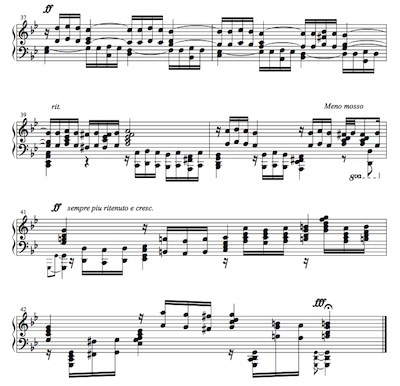 look inside Largo from Trio Sonata in c minor ~ Musical offering BWV1079 For Piano Solo. Baroque Period. Advanced Intermediate. Solo Part. 5 pages. Fabulous pianists, Paul Barton emailed me that he had played my arrangement Prelude in B minor after Siloti（BWV855a）. Surprisingly, his uploaded YouTube video shows the same as I did; playing by his left hand alone but holding his daughter by his right hand. I found this left hand arrangement by chance in the IMSLP Music Library and thought it would be nice to play to my daughter Emilie (5 months old). 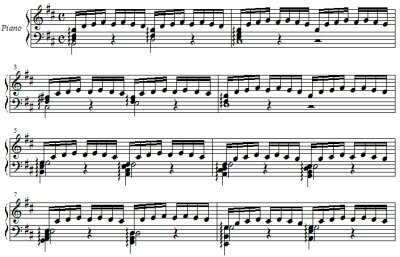 I made this video today and in adding the link to the sheet music Goggled the arranger Hiroyuki Tanaka and was happy to discover he too has a video playing this piece to his baby. J. S. Bach/ Sinfonia No. 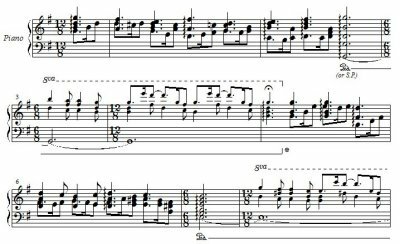 5 in E flat Major BWV 791, arranged for piano, left hand only by Hiroyuki Tanaka. J. S. Bach/ Adagio (2nd mov. 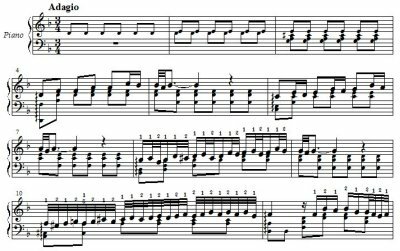 from Concerto in d minor after A. Marcello BWV 974) arranged for piano, left hand only by Hiroyuki Tanaka. J. S. Bach/ Chrale on 'Vom Himmel Hoch' from Christmas-Oratorio BWV 248, arranged for piano solo, right hand only (after W. Rummel's adaptation) by Hiroyuki Tanaka. A. Siloti/ Prelude in B minor after J. S. Bach (BWV 855a), arranged for left hand only by Hiroyuki Tanaka. 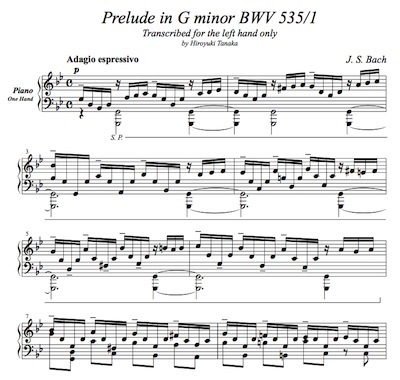 J. S. Bach/ Prelude from Prelude and Fugue in G minor BWV 535, arranged for left hand only by Hiroyuki Tanaka. Created on IMSLP a composer/arranger page of myself. I like music, especially by J. S. Bach's. 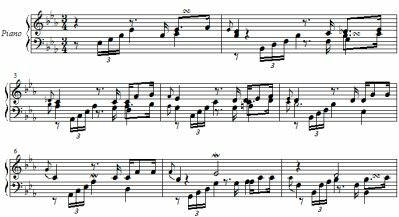 I'm collecting sheet music of Bach piano transcriptions. And also creating my own arrangement for piano solo, or one hand only. See my arrangements at IMSLP. Bach for One Hand uploaded to IMSLP by Hiroyuki Tanaka is licensed under a Creative Commons Attribution-ShareAlike 3.0 Unported License. Copyright © Bach with Piano (en) All Rights Reserved.